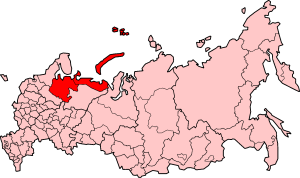 The North Russia Campaign (also known as the Northern Russian Expedition or the Allied Intervention in North Russia) was part of the Allied Intervention in Russia after the October Revolution. 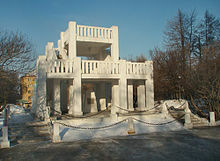 The intervention brought about the involvement of foreign troops in the Russian Civil War on the side of the White movement. The northern campaign lasted from the final months of World War I in 1918 through to 1919. In March 1917, a number of events occurred which changed the dynamics of World War I. Following the abdication of Russian Tsar Nicholas II and the formation of a provisional democratic government in Russia, the U.S. entered the war. The U.S. declared war upon the German Empire (and later upon Austria-Hungary). The Russian provisional government, led by Alexander Kerensky, pledged to continue fighting the Germans on the Eastern Front. In return, the U.S. began providing economic and technical support to the Russian provisional government so they could carry out their military pledge. The Russian offensive of June 18, 1917 was crushed by a German counteroffensive. The Russian Army was plagued by mutinies and desertions. Allied war material still in transit quickly began piling up in the already well-stocked warehouses of Arkhangelsk (Archangel) and the ice-free port of Murmansk. The Bolsheviks, led by Vladmir Lenin came to power in October 1917, established a communist government and five months later, they signed the Treaty of Brest-Litovsk with the Germans, which formally ended the war on the Eastern Front. This allowed the Germans to begin redeploying troops to the Western Front where the depleted British and French armies had not yet been bolstered by the American Expeditionary Force. Coincidental with the Treaty, Lenin personally pledged that if the Czechoslovak Legion would stay neutral and leave Russia, they would enjoy safe passage through Siberia on their way to join the Allied forces on the Western Front. However, as the 50,000 members of the Legion made their way along the Trans-Siberian Railroad to Vladivostok, only half had arrived before the agreement broke down and fighting ensued in May 1918. Also worrisome to the Allies was the fact that in April 1918, a division of German troops had landed in Finland, creating fears that they might try to capture the Murmansk-Petrograd railroad, the strategic port of Murmansk and possibly even the city of Arkhangelsk. prevent the Allied war material stockpiles in Arkhangelsk from falling into German or Bolshevik hands, mount an offensive to rescue the Czechoslovak Legion, which was stranded along the Trans-Siberian Railroad and resurrect the Eastern Front by defeating the Bolshevik army with the assistance of the Czechoslovak Legion and an expanded anti-communist force drawn from the local citizenry. Severely short of troops to spare, the British and French decided to request that US President Woodrow Wilson provide U.S. troops for what was to be called the North Russia Campaign or the Allied Intervention in North Russia. In July 1918, against the advice of the US War Department, Wilson finally agreed to a limited participation in the Campaign by a contingent of U.S. Army soldiers that was hastily organized into the American North Russia Expeditionary Force, which also came to be known as the Polar Bear Expedition. 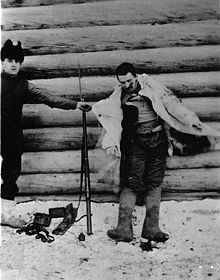 Picture - A Bolshevik soldier shot by an American guard at Outpost No. 1 at 3:00 a.m. on the morning of Jan. 8, 1919 when an enemy patrol of 7 men attempted to creep up on the outpost position. This picture was taken to show the white cloak, which all the members of the patrol wore to conceal their movements in the snow. The clothing worn by the man was warm and in good condition. He carried, in addition to a hand grenade, which lies on the ground, a Remington rifle, in good condition, and a plentiful supply of ammunition. Village of Visorka Gora, Russia. Jan. 8, 1919. (from the U.S. Army Signal Corps official photo caption). The British 6th Battalion Royal Marines Light Infantry (RMLI) was scratched together from a company of the Royal Marine Artillery and companies from each of the three naval port depots. Very few of their officers had seen any land fighting. Their original purpose had been only to deploy to Flensburg to supervise a vote to decide whether Schleswig-Holstein should be German or Danish. Many of the Marines were under 19 years old; it would have been unusual to employ them overseas. Others were ex-prisoners of war who had only recently returned from Germany and had had no leave. So, there was outrage when on short notice, the 6th Battalion was shipped to Murmansk, Russia, on the Arctic Ocean, to assist in the withdrawal of British forces. Still not expecting to do any fighting, the battalion was ordered forward under army command to hold certain outposts. A British Royal Navy Flotilla of over 20 ships - including 2 Seaplane Carriers, HMS Pegasus and HMS Nairana Approximately 5,000 United States Army soldiers 14 Battalions of British Commonwealth troops - Canadian Brigade and Australian Infantry, 2,000 French, Colonial & Engineers, 1,000 British-Serbian and Polish Rifles were assigned to assist Admiral Kolchak’s White Guard forces in the north and make a junction with his Siberian forces (Czechoslovak Legion) near Kotlas. A British Royal Air Force contingent comprising Airco DH.4 bombers, Fairey Campania and Sopwith Baby seaplanes along with a single Sopwith Camel fighter. 1,000 British-Serbian and Polish Rifles were assigned to assist Admiral Kolchak’s White Guard forces in the north and make a junction with his Siberian forces (Czechoslovak Legion) near Kotlas. A British Royal Air Force contingent comprising Airco DH.4 bombers, Fairey Campania and Sopwith Baby seaplanes along with a single Sopwith Camel fighter. Opposing this international force was the Seventh and Eighth Red Army; The "Army of the North West"; which was poorly prepared for battle in May 1918. The lines of communications south from Arkhangelsk were the Northern Dvina in the east, Vaga River, Arkhangelsk Railway, the Onega River in the west, and the Yomtsa River providing a line of communication between the Vaga River and the railway in the centre. This campaign saw the first ever coordinated aerial and naval bombardment and amphibious landing in wartime, namely the bombardment of the battery at Mudyug Island, Archangel, before its capture. The Red Air Force was still in its infancy with an assortment of World War I aeroplanes. The Allied occupation of Archangel itself took place on 2 August 1918. In September 1918, the Allies took Obozerskaya, around 100 miles south of Archangel. During the attack the RAF provided air support to the advancing Allied infantry, conducting bombing and strafing runs. On August 28, 1918 the British 6th Royal Marine Light Infantry Battalion was ordered to seize the village of Koikori (КойкарЫ) from the Bolsheviks as part of a wide offensive into East Karelia to secure the British withdrawal to Murmansk. The attack on the village was disorganized and resulted in three men killed and 18 wounded, including the battalion commander who had ineffectually led the attack himself. A week later, B and C companies, led this time by an army major, made a second attempt to take Koikori, while D company was involved in an attack on the village of Ussuna. The British were again repulsed at Koikori; the army officer was killed and both the company officers wounded. D company was also beaten off by Bolshevik forces around Ussuna, with the death of the battalion adjuntant, killed by sniper fire. The next morning, faced with the prospect of another attack on the village, one company refused to obey orders, and withdrew themselves to a nearby friendly village. Ninety-three men from the battalion were court-martialled; 13 were sentenced to death and others received substantial sentences of hard labor. In December 1919, the Government, under pressure from several MPs, revoked the sentence of death and considerably reduced the sentence of all the men. 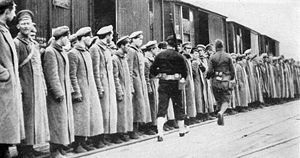 On September, with the Allied withdrawal already going on, a British detachment was sent by sea to Kandalaksha to stop sabotage operations carried out by Finnish Bolsheviks against the railway there. The British party was ambushed even before landing and suffered heavy casualties. Consequently, the unopposed Bolsheviks destroyed a number of bridges, delaying the evacuation for a time. Picture - Bolshevik prisoners under the custody of US troops in Arkhangelsk. A British River Force of eleven Monitors (HMS M33 and others), Minesweepers, and Russian gunboats was formed to use the navigable waters at the juncture of the Rivers Vaga River and Northern Dvina. Thirty Bolshevik gunboats, mines, and armed motor launches took their toll on the allied forces. The Allied troops, led by Lionel Sadleir-Jackson, were soon combined with Poles and White Guard forces. Fighting was heavy along both banks of the Northern Dvina. The River Force outflanked the enemy land positions with amphibious assaults led by American Marines together with coordinated artillery support from land and river. The Lewis Gun proved to be an invaluable and effective weapon because both sides were only armed with the Standard Issue Russian rifle of World War I, the Mosin-Nagant. Soldiers were inactive in the winter of 1918, building blockhouses with only winter patrols sent out. Within four months the Allies’ gains had shrunk by 30 - 50 km along the Northern Dvina and Lake Onega Area as Bolshevik attacks became more sustained. A steady withdrawal was made from September 1918. Fierce fighting took place on Armistice Day 1918 - the Battle of Tulgas (Toulgas); The Kurgomin-Tulgas line the final defensive line in 1919. Trotsky as Commander in Chief of the Red Army personally supervised this task on the orders of Lenin. The Bolsheviks had an advantage in artillery in 1919 and renewed their offensive while the Vaga River was hurriedly evacuated. 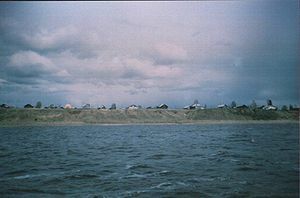 The furthest advance south in the conflict was a US Mission in Shenkursk on the Vaga River and Nizhnyaya Toyma on the Northern Dvina where the strongest Bolshevik positions were encountered. Allied troops were expelled from Shenkursk after an intense battle on 19 January 1919. The River Force Monitors made a final successful engagement with the Bolshevik gunboats in September 1919. The Allies then withdrew to prevent the Bolsheviks from carrying out the same tactics on the retreating Allied Forces. An international policy to support the White Russians and, in Churchill's words, "to strangle at birth the Bolshevik State" became increasingly unpopular in Britain. In January 1919 the Daily Express was echoing public opinion when it exclaimed, "the frozen plains of Eastern Europe are not worth the bones of a single grenadier". In February 1919, two sergeants from the British Yorkshire Regiment were court-martialled and given life sentences for refusing to fight. From April 1919, the inability to hold the flanks and mutinies in the ranks of the White Russian forces caused the Allies to decide to leave. British officers at Shussuga had a lucky escape when their Russian gunners remained loyal. The allies were forced to retreat. Minor operations to keep open a line of withdrawal against the 7th Red Army as far south as Lake Onega and Yomtsa River to the east took place along the Arkhangelsk Railway with an Armoured Train being manned by the Americans. The last major battle fought by the Americans before their departure took place at Bolshie Ozerki from March 31 through April 4, 1919. The Royal Navy's Baltic Squadron hemmed in the Bolshevik Baltic Fleet at the Kronstadt Naval Base, Petrograd (St. Petersburg ). Daring attacks were made by Coastal Motor Torpedo Boats (HM Coastal Motor Boat 4) based at Koivisto Sound, Finland, 50 km away, supported by RAF bombing raids against ships moored in the inner harbour of Petrograd slipping past the defensive screen of Bolshevik destroyers. Bolshevik minefields accounted for more losses of British naval units. Augustus Agar led the British small boats in the attacks. Churchill's Crusade: The British Invasion of Russia 1918-1920, Clifford Kinvig, London 2006, ISBN 1 85285 477 4.